Here is a selection of properties for sale in Spain. Well maintained finca with easy access and open views, 2/3 bedrooms, 2 bathrooms. The house stands on over 6.000m2 of land. 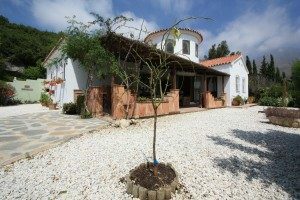 Very well presented 2/3 bedroom Finca situated just a short distance from Estepona with easy access. The house stands in over 6000 m2 of land and is situated at the end of the road with no passing traffic. The land is sloping and affords open views over the country side towards the sea. There is a swimming pool and extensive terraces, both open and covered. The property is approached by a long sweeping drive and provides spacious accommodation which briefly includes a large entrance hallways with circular staircase leading up to a “watch tower” study or 3rd bedroom which lovely views to the sea. Large lounge with fireplace with cassette grate. Kitchen with granite work tops and built in oven, ceramic hob and fridge. Master bedrooms with fitted wardrobes and modern bathroom en suite, 2 bedroom also with fitted wardrobes and en suite shower room. Laundry room/store with washing machine. To the front of the house there is a delightful covered “lounge” terrace and to the rear a secluded dining terrace. Garage and car port, gravelled drive-way with parking space for several car. Sun trap swimming pool with decked terrace adjoining. Licensed well, town water. Double glazing. Vendor keen to sell and open to offers. One of our 5 star properties for sale in Spain. Beach-side 4 bedroom, 4 bathroom townhouse only a short walk away from the center of Sabinillas, early inspection recommended. Spacious 4 bedroom end townhouse with private garden situated a short walk away from the beach. Sabanillas Town Centre is within easy walking distance. West facing private garden plus solarium. Community gardens with pool. Great value for money. Early inspection recommended. This well presented townhouse has the unusual feature of 4 bedrooms and is ideal for family living. Situated in Marina de Casares the house is only a short walk away from the beach and and also from the shops, restaurants and supermarkets of Sabanillas. The accommodation is very spacious and briefly includes an open porch way, entrance hall with guest w.c., lounge with dining area and open fireplace, enclosed terrace providing a further sitting area and study leading to a private west facing garden. Kitchen with fitted units and appliances including built in oven hob, washing machine and dishwasher. Large fridge/freezer (american style), Utility terrace off. On the first floor the large master bedroom has fitted wardrobes and a shower room en suite. There are two further bedrooms on this level, both with fitted wardrobes and a shared bathroom. The 4th or guest bedroom is on the upper level and from here there is access to the solarium which has all day sunshine and a built in barbecue. The rear garden is west facing and has direct access to the community garden and swimming pool. One of our 5 star properties for sale in Spain. Spacious duplex penthouse in top development in Golf Rio Real close to Marbella center, 3 bedrooms, 2 bathrooms. Beautiful duplex penthouse in a top-development in Golf Rio Real close to Marbella centre. The property features a brand-new fully equipped open plan kitchen, an ample lounge with dining area, three bedrooms, two bathrooms, one cloakroom for guests. Qualities: A/C hot and cold, alarm system, cream marble floors, double glazing, electric blinds, electric entry phone, underfloor heating in bathroom, built-in wardrobes and cupboards, etc. Included in the price are 2 parking spaces + 2 storerooms in the underground garage. The property forms part of a small community with only 2 blocks and a total of 56 units, sharing community gardens with large swimming pool for adults and 1 children´s pool. One of our 5 star properties for sale in Spain. Built 210m2 including 40m2 of Terraces, 3 bedrooms, 2 bathrooms, 1 cloakroom for guests. Highly Recommended, sleek modern ground floor apartment with two private gardens, east and west facing, 2 bedrooms, 2 bathrooms. Four Seasons Flamingos – Highly, highly recommended. Sleek, modern ground floor apartment with two private gardens, facing east / west, very bright and nicely decorated. The apartment comprises a hall entrance that take us to the rest of the house. To the right of the hall is a spacious and bright contemporary designer kitchen, fully furnished, also has a breakfast table and is equipped with fridge, washing machine, oven, hob, extractor and microwave. The hall opens to the left and from here you access to the bedrooms by a small corridor on the right and into the living-room to the front. The living-dining room, spacious and bright with fireplace opens its doors to large covered terrace and private garden, facing west and overlooking the pool, adjacent golf courses and the sea. The master bedroom has direct access to the terrace and garden and has a spectacular en suite bathroom, including bath and separate shower. Also fitted wardrobes. The second bedroom also has fitted wardrobes and it has a private terrace with private garden. There is a further second beautiful and complete bathroom. The property includes underground parking. This gated urbanization next to the Campo de Golf Los Flamingos, offers 24H security, large common areas with a nice plaza and fountain, two gardens and private pools. It is very close to the Hotel Villa Padierna – Ritz Carlton, plenty of excellent golf course, as well as supermarkets, restaurants and bars. One of our 5 star properties for sale in Spain. Spectacular family villa close to all amenities. Beautifully refurbished 6 bedrooms, 5 bathrooms in the heart of the golf valley. Beautifully refurbished 6 bedroom, 5 bathroom detached home situated in the heart of Nueva Andalucia´s “Golf Valley” a short distance from Puerto Banus and affording easy access to all amenities. The property is spacious and beautifully pointed and features a fantastic American style family room/kitchen. The accommodation comprises an impressive entrance hall with full height ceiling, guest w.c.. Large lounge with dining area and feature fireplace including a cassette grate, full height windows opening onto the pool area and garden. Study/ tv lounge with access to the pool. A feature of the property, the kitchen/family room including a living area with working fireplace, central island unit giving breakfast/dining space. Granite work tops and a full range of appliances by Bosch including oven, combination microwave, dishwasher, fridge and American style fridge freezer. Walk-in larder. Guest suite including 2 bedrooms both with fitted wardrobes, one with en suite bathroom plus a guest w.c..
On the first floor the Master bedroom has a large walk in dressing room and en suite bathroom with bath and shower. Access to a south and west facing terrace. 2 further bedrooms, both with fitted wardrobes and en suite bathrooms. Separate guest apartment with living/dining area, kitchen with granite worktops, built in oven, hob, washing machine and fridge freezer. Bedroom with fitted wardrobes and bathroom. At basement level there is extensive storage space or games room together with a laundry area with washing machines and drier. Car drive-in with automatic gate and parking space for several cars. Well stocked gardens with automatic irrigation. Large pool with roman entry and extensive sun deck. Covered side terrace with dining area and built in summer kitchen including a built-in oven, hob, griddle and fridge. Under floor heating, double glazing, air conditioning and electric blinds. One of our 5 star properties for sale in Spain. 5-10 minutes to Golf Course, 5-10 minutes to shops, Air Conditioning Hot/Cold, Automatic Entrance, Automatic Irrigation System, Ceiling Fans, Electric Blinds, Fireplace, Fitted Kitchen, Fitted Wardrobes, Picturesque Garden, Sep. guest accommodation, Separate Apartment, Swimming Pool, Underfloor Heating, Walking Distance to Rest. Lovely family villa with delightful gardens and pool, 4 bedroom all en suite. Sea view, car port for 2 cars, established location with no community fees. Lovely family villa with delightful gardens and pools and sea views. Spacious 4 bedroom, 4 bathroom (all en suite) accommodation with modern fitted kitchen utility room and 2 car car port/garage. Established location with no community fees. In the Benahavis municipal area. The superb family house has recently been reduced in price and now offers great value for money. The accommodation is planned for comfortable family living and briefly comprises an entrance hallway with guest w.c., spacious lounge with open fireplace and access to a cosy covered terrace overlooking the pool and garden. Split level dining room with access to the open terrace and pool. Sea views from both lounge and dining room. Fitted kitchen with granite worktops and splash backs, built in oven, ceramic hob with cooker hood, microwave and fridge. Breakfast space. 2 double size ground floor bedrooms both with fitted wardrobes and en suite bathrooms. On the first floor there is a large master bedroom with fitted wardrobes and access to a private south facing terrace with sea views. En suite bathroom with bath and shower. 4th bedroom with fitted wardrobes and en suite bathroom. Lovely landscaped garden with an abundance of shrubs, plants and fruit trees. Automatic irrigation. Large swimming pool with roman entry and extensive terrace areas for sitting and al fresco dining. Double width carport/garage with drive-way and automatic gates. Hot and cold air conditioning, marble floors. Plot 1050 m2 Built 216 m2 + Garage and terraces. One of our 5 star properties for sale in Spain. Contemporary style villa on a large double front line golf plot with fantastic golf views. 4 bedrooms, 5 bathrooms. Contemporary style detached Villa on a large plot with fantastic front line golf views. 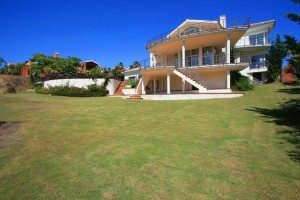 An individually designed detached Villa standing in a large plot on the front line of Atalaya Golf course. The house is built a very contemporary design with accommodation briefly comprising : Imposing entrance hall, open plan to a living room with vaulted ceiling and open fireplace access to the large covered terrace and split level to a dining room which in turn leads to the kitchen. Fitted units with granite worktops and splash backs, Bosch oven, microwave, dishwasher and fridge freezer. Ground floor bedroom and en suite bathroom. On the first floor there is large galleried landing/living area Master bedroom with bathroom en suite and two further bedrooms with en suite bathrooms plus a study with bathroom. Two car garage, covered parking for further cars. Extensive landscaped gardens and large pergola. Hot and cold air conditioning. Marble floors. One of our 5 star properties for sale in Spain.